Charlottesville’s new manager introduced himself at a news conference today. He has a PhD in public policy from Virginia Commonwealth University, began his career in Richmond but has served, most recently, as manager of DeSoto, Texas, a suburb of Dallas. Sandy Hausman spoke with him and filed this report. Charlottesville's new city manager, Tarron Richardson (left) and Vice Mayor Heather Hill speak with reporters. As an undergrad at Lincoln University, Tarron Richardson was a star. The 1999 graduate ended his basketball career with 1,512 points and 1,085 rebounds --- both school records, and during his senior year he executed a dunk and shattered the backboard. 20 years later, he seems more relaxed but pledges to an active leader of the city’s management team. 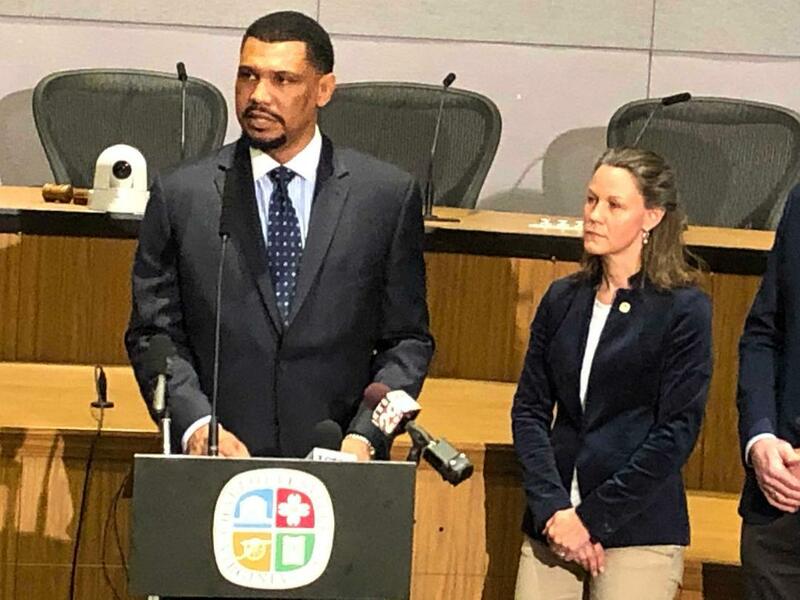 Richardson said he is not afraid of controversy and is concerned by a recent report that more than half of those arrested by police in Charlottesville are black – accused of breaking drug laws, violating the terms of probation or driving without a license. African-Americans are less than 20% of the city’s population. On a lighter note, Richardson said he still loves basketball and was with the winning team during the NCAA champtionship. “I was probably the only one in the state of Texas cheering for UVA,” he joked. He’ll start work in mid-May, earning an annual salary of $205,000.